Beginning this month, many pharmacies and medical supply retailers in New York will have a new medication adherence system for their customers, the MedPro Pill Organizer. For many seniors, the difference between being able to live independently and move to a nursing home is the ability to continue properly adhering to a medication regimen. For all of New York, Automated Security Alert (ASA) is pleased to announce that it is now offering seniors and other patients with complex medication schedules the MedPro Pill Organizer. Matthew Couillard, Director of Customer Relations for the regionally-based medical technology company, is enthusiastic about the launch of the MedPro Pill Organizer product. The launch of the MedPro Pill Organizer is the latest in a series of recent ventures undertaken by ASA, where Mr. Couillard is part of a highly trained team of employees that have been working to make Automated Security Alert a regional force in the area of elder care. The company, which is owned and operated by Mr. Vincent Nigrelli, has been serving seniors in New York, Washington D.C., Maryland, Pennsylvania, Virginia and West Virginia for over twenty-five years, in addition to serving products directly to customers nation-wide. The products offered by Automated Security Alert are well-established within the senior community. No stranger to the area of technology-based senior care products, ASA has been providing seniors with both wearable and non-wearable medical alert systems and fall detection devices, medication management systems and organizers, and other products that can aid independent-living seniors in their quest to retain personal autonomy. At present, ASA is currently serving thousands of seniors across the nation, utilizing its regional base and tight-knit team of highly-trained employees offering affordable prices and the highest quality of customer service. Mr. Couillard cites proper medication management as being of paramount value to seniors. “For many seniors, the difference between being able to live independently and move to a nursing home is the ability to continue properly adhering to a medication regimen.” Rather than move to a nursing home, which, as a February Pittsburgh Tribune-Review article noted, costs on average between seven and eight thousand dollars per month, seniors can now utilize the Med Pro Pill Organizer and similar products to enable them to continue living independently at home. The specs of the MedPro Pill Organizer are indeed impressive, and make the product fit in perfectly with the rest of the company’s medication management line, while offering advanced, new utilities and functions that streamline its use. For example, like the other medication management systems ASA offers, the MedPro Pill Organizer comes equipped with a secure lock to prevent accessing multiple doses of medication at once which, in turn, ensures that the unlocking of the correct compartment occurs only at the prescribed dosage time. A new feature of the MedPro Pill Organizer that makes it unique amongst the ASA medication organizer product line is that the Organizer allows the user to communicate through a cellular network and control the Organizer remotely via an online web portal. The functionality of the Organizer is further enhanced by its size and casing: in effect, the Organizer bears strong resemblance to a basic seven-day pillbox. Rather than require the user to grapple with digital readouts or buttons, the system was designed with a simple, user-friendly interface that provides explicit instructions regarding how to set up and manipulate the device. In total, the medication organizer can hold up to 28 doses of medication and remains ready to accommodate dozens of different types of pills. 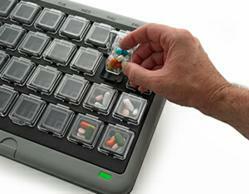 Two key additional features of the monitored pill organizer are its patient alerts and remote monitoring capabilities. The former feature alerts the patient when it is time for a new dose of medication by flashing a light that glows in the compartment. Should the user then fail to remove the medication cup to take his or her pill within the assigned time, the user will begin receiving auditory alerts as well as optional automatic phone calls, text messages and emails informing him or her that it is time to take the medication. The latter feature, remote monitoring capabilities, allows the MedPro Pill Organizer to keep records of patient compliance. In turn, the caregiver can view a patient’s compliance history via the online web portal or by receiving real-time email or text message notifications. In addition, compliance reports may also become available by email weekly, should the user opt for that feature. All told, these two features offer additional, comprehensive means of ensuring patient compliance with a medication schedule. Furthermore, the monitoring services provided by ASA are available around-the-clock, 24 hours a day, 7 days a week. Indeed, if you or a loved one are interested in such a medication organizer, the folks at Automated Security Alert are ready to help. Along with product installation of the device, ASA offers in-home training for users of their products to ensure that customers will be able to effectively deploy alerts with needed. In addition, ASA provides potential customers with a variety of contract options, offering its products and services in both one-month, trial form as well as long-term plans. Visit AutomatedSecurityAlert.com, email customerservice(at)automatedsecurityalert(dot)com, or call 1-800-338-7114 for more information about ASA products and services. ASA’s friendly staff are ready to assist you with any questions or concerns you might have about ASA products and how they might benefit you or a loved one.